Each week, we will post an arrest of interest pointing toward arrest and crime trends within Arcadia. One of the newer members of APD, K9 Zoli and his partner proved to be valuable assets this past week. Last Thursday, February 9th, a suspect led officers on a dangerous vehicle pursuit in the south end of town. An officer had attempted to stop the suspect for traffic violations but the suspect chose not to yield. The pursuing officer called off the pursuit due to the dangerous and felony evading of the suspect. A short time later, the suspect vehicle was found abandoned in the 400 block of Rosemarie Drive. The vehicle had been involved in a collision and was no longer drive-able. Inside the suspect vehicle, officers found shotgun ammunition and other items leading to identify the possible driver as a subject with a "no bail" warrant. K9 Zoli and his handler Officer Foulks were called to assist in a search for the felony suspect. While looking for the suspect, K9 Zoli alerted to a backyard pool bathroom at a home in the 400 block of Palm Drive. K9 Zoli then located the suspect inside the bathroom. During the apprehension, the suspect was bitten by K9 Zoli and the suspect was taken into custody. He was later treated for his injury at a local hospital and he was cleared for booking. 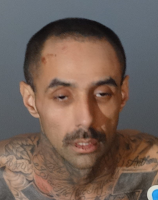 Terence A. Warner, a 35-year-old male from Baldwin Park, was booked at the Arcadia City Jail on felony charges. In an unrelated incident, K9 Zoli and Officer Foulks were called to assist an outside agency at a local hotel. The request was for a narcotics search of the hotel room. During the search, K9 Zoli alerted and located approx. 15 lbs. of methamphetamine. 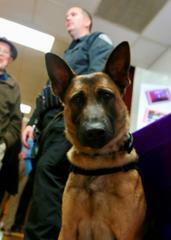 Zoli is cross-trained for both apprehension and as a narcotics search K9. Anyone with information on these cases is encouraged to contact the Arcadia Police Department at 626-574-5156. Or, if you wish to remain Anonymous, call “LA Crime Stoppers” by dialing 800-222-TIPS (8477), use your smartphone by downloading the “P3 Tips” mobile app on Google play or the App Store, or by using the website http://lacrimestoppers.org.